So my last post, (Maybe Mexico - remember that - it’s our mantra) I mentioned over the next few weeks. There is so much going on, it’s hard to keep it all in my brain. In fact, I can’t - and it keeps spilling out my mouth and fingertips, and when it gets bad, out my eyes. But there’s some truly awesome stuff coming up at JessicaSprague.com. I can’t WAIT! Of course there is the 4th in my series of digi classes, Digi: In Deeper, which I’m very excited, and also a little bit nervous for - it’s a HUGE, HUGE amount of work, but it’s always so fun to do a brand new class. And by the time you’re at the advanced level, the beauty of what you can make is just so cool to be a part of. And of COURSE there is the other big one - my first time team-teaching a HYBRID class, my first class that I’ve ever shipped kits for, the first time we’re making four gorgeous printed/glued/embellished/amazing projects - Mouse, Paper, Scissors. Heidi and I are so EXCITED for this! She blogged her thoughts about it today as well! Oh my freaking heck. Could you die? We’ve had lots of questions regarding what’s in the kit﻿, and this gives an idea of a few of the items. Glimmer mist. Chalkboard spray. Glitter. Frame. Easel. Cardstock. Envelopes. Chipboard. Transparency. Ribbon. Rhinestones. Ruffles. Tissue Paper. Embellishments. More. And this is just the physical supplies we’re shipping to your house. Wait until you feast your eyes and your mouse upon the absolute deliciousness coming your way in the digital kit you’ll get as well. We’ve also had lots of questions regarding what you’ll learn. AND - see the background of this frame? This is so, so cool. We’ll be making the background ourselvesusing the Photoshop Type tool (plus a few other tools! you’ll have to come see! ), and filled with our own written words. Gorgeous? Yep. Personalized? Absolutely. That’s the beauty of mixing digital and traditional crafting. Many have asked if it’s a repeat of my beginning digital class, Up & Running with Photoshop - and while some of the techniques (installing brushes, using clipping masks) are the same, all of the techniques in this class are geared toward creating the printable components of fully functional items such as cards and albums. It’s a whole new way of thinking in Photoshop, and I think you’ll LOVE it. We kept the projects for the most part in the “craft” realm vs. specifically scrapbooking, for those of you die-hard digi scrappers who don’t want to make ‘hybrid’ layouts (I get that, totally). But that’s no reason not to dive in and make some mini-albums, and the exquisite piece of personal decor you see above. In fact, there’s every reason to branch those digi skills out into the physical world in this beautifully guided way. I think the reason I’m so excited about this class is that I’ve gotten the opportunity to work closely with one of the most creative and talented and humble people I’ve ever met - Heidi Swapp. You’ll love her. I hope you get to meet her some day. She is cute and hilarious and real. And amazing. I gush. You get the idea. The other reason I’m really excited about this class is that I started out as a “hybrid” (paper+digital) crafter myself. I used Photoshop extensively at my work as a web designer, but when I found scrapbooking, it was the FEEL of things - the textured cardstock, the sheen of a photo printed on luster paper, the texture and dimension of embellishment placed by hand - that attracted me to the hobby. So it’s always been about The Mix for me. How can I take advantage of my mad PS skillz and still be able to put a little glue to paper and make something? Always the search for that answer keeps me going. 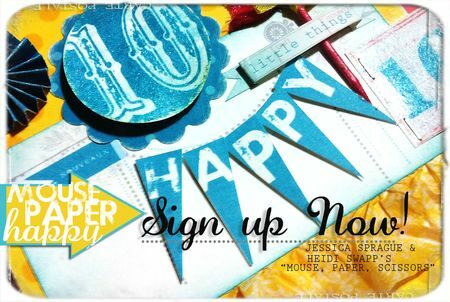 And top that off with the opportunity this class gives for me to share that passion with hundreds of crafters by shipping out the EXACT materials you’ll need to complete the projects we’ve planned? I’m basically in teachy/techie/crafty/hybrid/hog heaven. True dat. So, will you join me on this great adventure? Even if you’ve never opened Photoshop, or even if you’ve made hundreds of digital pages, I think you’ll find something to love in this class. And think of the cuteness you’ll make! Think of the pink glitter! Join today. Bring a friend. Love your printer. Apr 21 I am here.